The Department of Labor (DOL) Fiduciary Rule was scheduled to start on April 10, 2017 but President Trump signed an executive order delaying the rule 180 days so that the DOL could carry out “economic and legal analysis” on the rule’s potential impact. If this legislation is not stopped by the new administration, it will require all financial professionals who work with retirement plans to be fiduciaries and be bound legally to meet that standard. The fiduciary standard demands that advisors act in the best interests of their clients, and to put their clients’ interests above their own. Advisors cannot conceal any potential conflict of interest and all fees and commissions must be clearly disclosed in dollar form to clients. Advisors who wish to continue working on commission will need to provide clients with a disclosure agreement, called a Best Interest Contract Exemption (BICE), in circumstances where a conflict of interest could exist – such as, the advisor receiving a higher commission or special bonus for selling a certain investment product. The goal is to insure that the advisor is working unconditionally in the best interest of the client. All compensation that is paid to the fiduciary must be clearly spelled out as well. The account that are covered are only retirement plans: 401(k) plans, 403(b) plans, employee stock ownership plans, Simplified Employee Pension (SEP) plans, Simple IRA, Individual Retirement Accounts (IRAs),Annuities, HSAs, Coverdells, and defined-benefit plans. Fiduciary is a much higher level of accountability than is currently required for financial salespersons, such as brokers, planners and insurance agents, who work with retirement plans and accounts. “Suitability” meant that as long as an investment recommendation met a client’s defined need and objective, it was deemed appropriate. If this rule passes, financial professionals will be legally obligated to put their client’s best interests first rather than simply finding “suitable” investments. The new rule could eliminate many commission structures that are currently common. Fee only advisors, who are already fiduciaries (such as AIO Financial), will be required to provide written acknowledgement of its fiduciary status and document the reasons why advice given to the client regarding their retirement assets was in the best interest of the client. For fee only (fiduciary) advisors who are compensated based on the assets under management, they will need to justify rolling 401(k) assets or other held-away accounts into directly managed IRAs because, as a result of their advice, the advisor will receive increased compensation from directly managing the IRA assets. This rule will add a small burden to the work of financial advisors managing retirement accounts, but that is a small price to protect investors by providing transparency about fees and conflicts of interest. It amazes me that financial salespeople (brokers) are able to make recommendations that are clearly not in the client’s best interests but are “suitable” investments. Currently, financial salespeople (not fiduciaries) can sell high commission annuities and other products to people without them knowing the reason they are being put in these investments is to generate commissions, not because they are the best fit for the client. 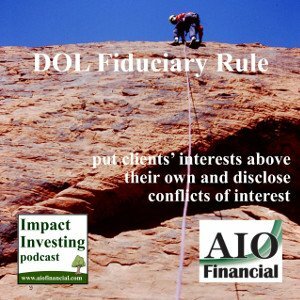 We will see if the DOL Fiduciary Rule actually gets implemented. I’ll keep you posted.